Trail Blazers kept their winning streak alive by catching a fierce victory over Celtics. The breeding of a strong defensive bet survived Head Coach Terry Stotts' keep a marred shot night on offense. Damian Lillard's 33-point outbreak provided the scoring punch, which put Portland over the top, but gritty performances by Maurice Harkless and Jusuf Nurkic kept Blazers afloat. It was a similar recipe for Celtics on Wednesday. Kyrie Irving provided fireworks and Marcus Smart held Boston in the mix with his relentless play at both ends of the court. In the end, Nurkic and Lillard showed too much for Celtics in the last six minutes of the fourth quarter. -19 from deep in the second quarter, it was Blazer's aggressiveness that gave them the edge for half an hour. At half, Portland's shooting rate rested at a weak 35.6 percent. Despite the nasty recording, Blazers adhered to a slim one-point lead thanks to their work in the margins. With benefits in both offensive rebounding and free throw attempts, Stotts & # 39; squad bought enough time to find their rhythm. Portland's renewed second unit became its first forgettable outing. One's edges were targeted by Celtics' crime, Rodney Hood and Seth Curry produced a goose egg in 40 minutes of combined work, and Layman had remarkable drains at both ends of the court. The battles from Blazers' reserves were enhanced by exciting games from Celtics & # 39; bench. Gordon Hayward released Brad Stevens coach in the first quarter, and Jaylen Brown recorded his second double-double season in 30 minutes of action. Portland's re-tooled rotation was destined to hit a few speed holes after the All-Star break. Even when Celtics routinely placed Edges in hard spots, Stotts remained committed to his new big trap over Zach Collins. Nurkic took the wind out of Celtics' attack late in the game. Boston's small ball line was put to rest halfway through the fourth quarter when Bosnian Beast returned to court. Nurkic feasted as Celtics & # 39; failed to move the big trap out of the post. At one point, Robert Williams was summoned by the bench to go toe-to-toe with Nurkic. The results were not beautiful for the little used youth. Nurkic ended a violent dunk and helped Blazers strengthen a turnover in the defense. Williams returned to the bench after 30 seconds of action. Lillard overcame a hard sky by moving downhill. He successfully counteracted Celtics' perimeter pressure by earning 24 of his 33 points from the three-point line. Along with strong defensive contributions, Harkless was ruthlessly in error. Four of his 10 rebounds came on the offensive end and he finished with 17 points to complete a robust double-double. Al-Farouq Aminu only tried two shots from the field, but his only conversion could not have come to a better time. 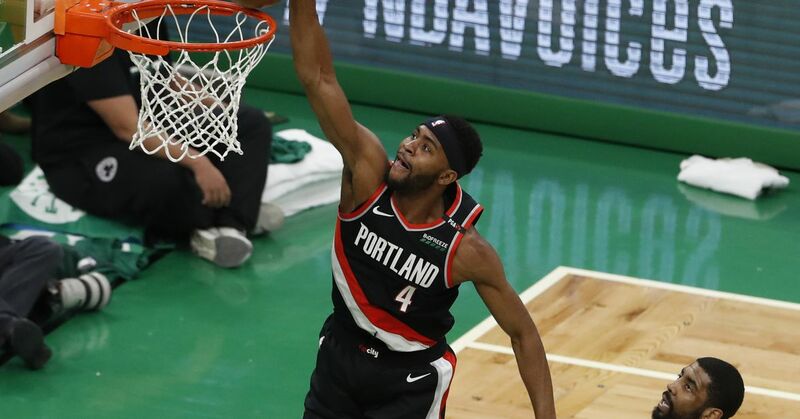 His late-game three-pointer helped Blazers stellar Celtics rally. Outside his skinny points total, Aminu finished nine rebounds and two steals. Blazers returns to action on Friday with a trip to Canada to see Raptors.